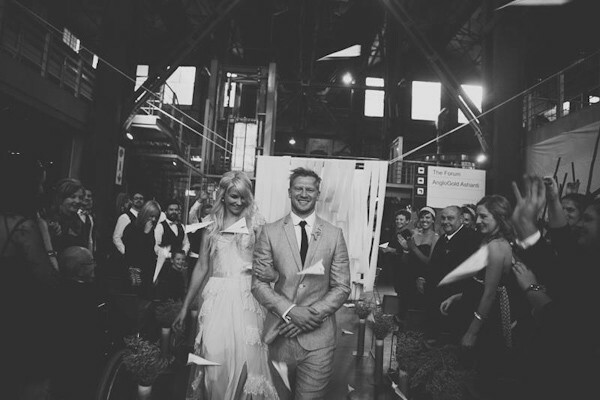 Turbine Hall Johannesburg South Africa Real Wedding. Some venues boast such rich history that the structure alone is enough to leave guests speechless. For this wedding in Johannesburg, South Africa, Turbine Hall, which dates back to the 1920s, was the perfect venue choice. But its high industrial ceilings are no accident, this former power plant now offers an awe-inspiring experience for brides and grooms. 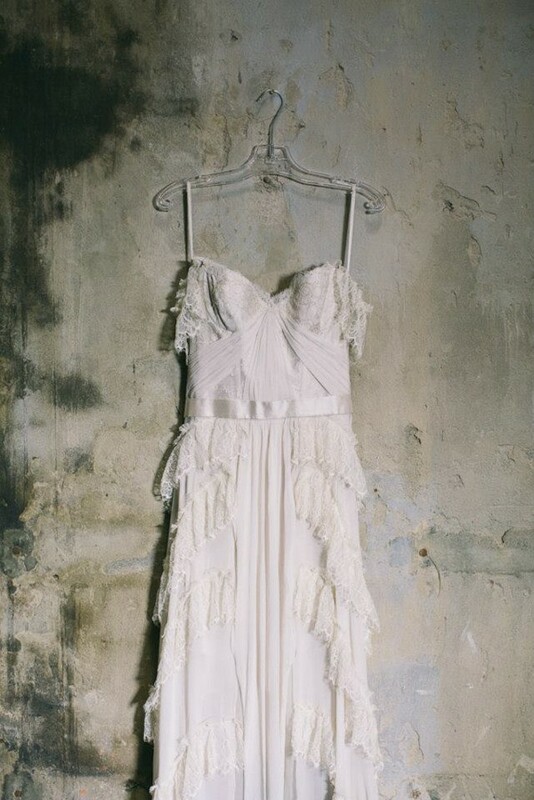 The bride, with bold blonde locks, wore a lace and ruched empire-waist dress with thin straps and a ribbon waistband. She carried a large bouquet of simple white wildflowers. 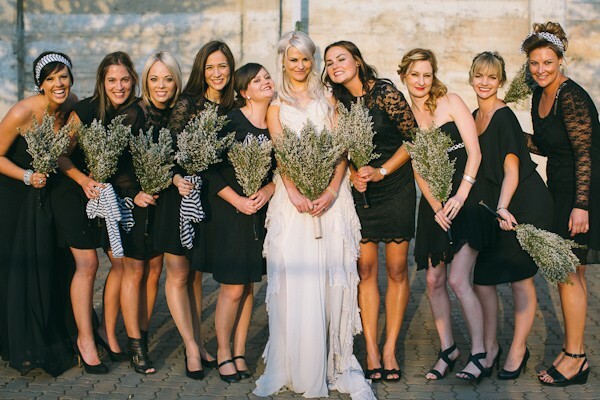 Her bridesmaids carried similar bouquets tied with black and white striped fabric. Each lady wore black shoes and a black dress of her choice. The groom looked quite posh in a slim-fit gray suit and black tie. His groomsmen wore white shirts, black vests and black pants, with a fun black and white striped bowtie. The ceremony space was outfitted with modern gray chairs. Handmade paper airplanes served as the ceremony programs. The incredibly long aisle was flanked with simple flower arrangements on each side and an intricately cut wall of white fabric sat at the head of the altar. 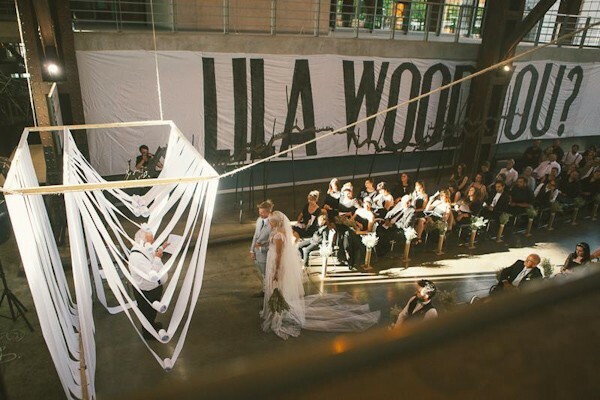 On the side of one wall was a large white cover with the words â€œLila Wood You,â€ clearly a message to the bride. When the ceremony was complete, the couple exited amidst a flurry of paper airplanes and the fashionable duo made their way outside for formal photographs. Their large bridal party looked very well coordinated. The couple held hands and walked on the cobblestone around the outside of the venue, admiring its historic beauty painted with the setting sun. Continuing the handmade trend, at the reception guests found their seats from personalized hanging jars of candy. The reception area featured long sleek tables with flower arrangements hanging upside down from the rafters. White tables were covered with gold runners and flower arrangements with succulents, flowers, and even decorative cow skulls â€“ certain to have been a conversation piece. Each place setting included a black napkin, gold napkin ring and personalized wooden animal plaque. Table numbers were designated by black laser-cut signs held in small wooden crates with beverage carafes. 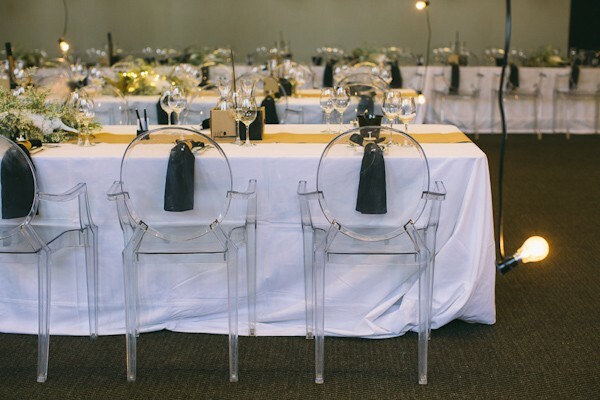 The final exquisite touch was the clear Lucite chairs for each guest. The couple enjoyed their first dance as husband and wife. They gifted their guests with the chance to take part in a homemade photo booth with hand-drawn backdrops. Creativity comes from the heart and anything handmade certainly possesses a generous degree of love and attention. 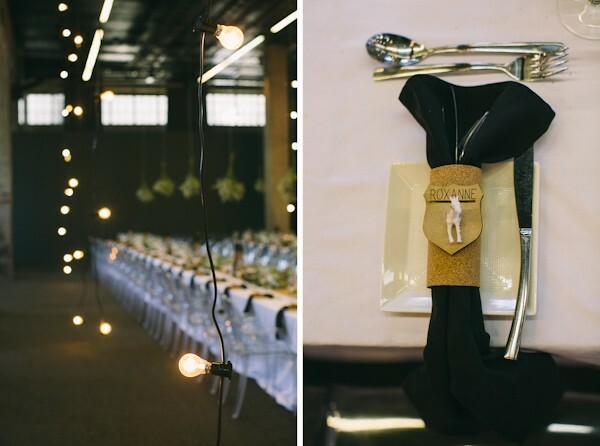 This South African wedding proved that a handmade detail can be artistic, fun and exclusive. What a beautiful and modern event for such a time-honored tradition!